This popped into my email this morning from one of our long term patients. How lovely! 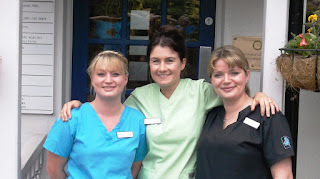 "My family and I have been coming to Longborough Dental Practice for over 12 years. We continue to be so impressed with it. The excellent care given to us by the Patient Advisors, the professionalism of the the dental nurses (and their lovely happy smiles) and the treatment given to us by the Hygienists and Dentists have continued year on year. My children feel so at ease with Dr Emma McFarlane as the dentist and I love her holistic approach and genuine concern that she has for us all. We all feel so secure in her care. Recently I have had to have some treatment from Mr Richard Snoad the Periodontist. What a life changing difference it has made to my life. I genuinely believe he has saved my teeth and I cannot thank him enough. I can highly recommend this dental surgery". Thank you all for your on going care! We genuinely appreciate it and are so grateful for the way you all go 'above and beyond' in your jobs! Well done! I hope everyone tells you what a good job you all do!.. it's a rare and precious thing to find these days.